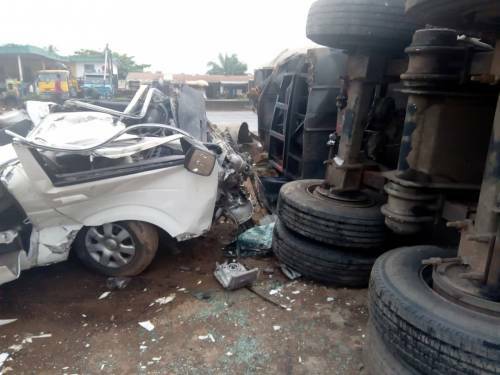 Three persons lost their lives on Tuesday in a fatal road accident, which occurred on Ode Aye-Okitipupa road in Okitipupa Local Government Area of Ondo State. The trio died when their commercial motorcycle veered off its lane and rammed into the articulated vehicle driving on the other side of the road. The deceased were thrown off the motorcycle in different directions. One of them was crushed by a speeding vehicle. Occupants of the vehicles, a Golf Volkswagen with registration number CH 978 GGE and a diesel truck with registration number AKD 28 LG, were seriously injured as a result of injuries sustained in the fatal accident. SR reports that Wasiu Ojeyemi and Taiwo, who were in separate vehicles, were immediately rushed for treatment in a nearby hospital in Ode Aye. Anthonia Adekemi, spokesperson of the Ondo State Sector Command of the Federal Road Safety Corps (FRSC), said he could not immediately confirm the accident when contacted. "I am yet to really confirm this, but I will get back to you," she said. However, Police sources in the town confirmed the accident, adding that the bodies of those who died in the road crash have been evacuated and deposited in the morgue.